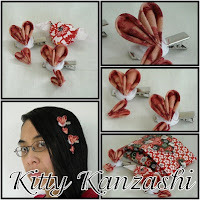 For your viewing pleasure, a pair of valentine kanzashi hairclips with fabric hearts made using the “tsumami” technique. A perfect gift to present as a secret admirer maybe? As well as receiving a pair of heart kanzashi hairclips, if you order this before Valentines Day, you will receive a origami heart and it will be gift wrap just like in the pictures.